The Holy Island of Lindisfarne is cut off from the mainland twice a day during high tide. During these times the causeway leading to the island (“Holy Island Causeway”) is submerged, either in parts, or entirely, and it is impossible to cross. If you are unfamiliar with the causeway and the workings of the tides, it is best to educate yourself first, lest you become one of the unfortunates (read: idiots), who have to get rescued at taxpayers’ expense. If you have any concerns about crossing the causeway, you shouldn’t. As long as you obey the official crossing timetables, you’ll simply be driving on a normal road, with perhaps a bit of mud on the surface. With the exception of stormy weather or exceedingly high tides and high winds, there’s really nothing to the crossing. If you’ve never crossed the causeway to Holy Island at low tide, you might be surprised to discover it is a normal road, and serves everything from commuter vehicles to flat-bed lorries. As long as you plan your crossing for the right times, there is really nothing difficult to the crossing. 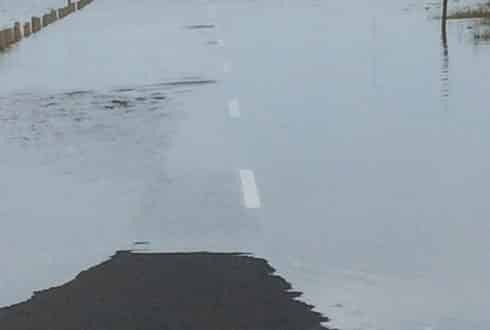 Yes, in winter the road gets a bit muddy and sandy, and you might drive through water puddles, or even a thin layer of surface water in particularly stormy weather, but other than that it’s simply a road. The national speed limit applies on the causeway, though a lot of drivers seem to become overawed by the view, or are unsure of the rules and go at a steady 40 or even 30 mph. The impatient car overtaking you is probably a local. First thing first: ALWAYS check official crossing times on Northumberland Council’s Holy Island Tide Times page. If you’re visiting once and have no familiarity with the causeway, best thing to do is play it safe and stick to the official crossing times. Now, here’s the important bit: the main risk to drivers is if they try to cross after the official time when the tide is rising. Yes, there is some flexibility, based on weather, sea conditions and tide height on the day, but unless you’re a local with good knowledge of how the causeway works, you should never attempt this. About once a month a driver attempts to ‘race the tide’ and gets stuck, with their vehicle being written off, and an expensive rescue launched. It’s also the case that if for some reason you break down or get stuck in the mud, there will be no time to tow you away. If you are coming onto Holy island and get to the start of the causeway a little before the official crossing time (that is, when the tide is receding) – and if there is no sea water between you and the bridge (where the shelter is) – it is usually safe to proceed. If you do come across water further along, you can simply wait until it clears, or until you see someone else (usually the locals) cross. Having said that, please use good judgement. If you are driving a mini and see a Range Rover crossing, it doesn’t mean you can too. And I’d like to stress again: do not take any chances when the tide is RISING. It’s very easy to misjudge the speed of rising seawater onto the causeway. When coming off the island earlier than the official time when the tide is receding, one measure that helps predict the causeway is clear is to count poles from the Island-end entrance to the causeway. If the water has retreated from the base of the first five poles, then you can set off, but again (and I cannot stress this enough, sorry), don’t try to cross if you encounter water that looks impassable. The calculations the council uses to provide safe crossing times are based on a (conservative) formula that takes into account several factors. The most important of these are the timing of high and low tides and the projected height of each tide (though there are other factors too). The default crossing time assumes the causeway will not be passable up to two hours before high tide and three hours after it. These defaults are then reduced or increased based on the height of the projected tide. You can check tide heights for the next seven days on the UK Hydrographic Office website or, if you are a regular visitor, buy an annual tide table from the Holy Island Post Office. The tides range between about 3.5m (very low) and 5.3m (very high). That said, I don’t want to give you the impression that this is an exact prediction science. Changing winds and barometric pressure can create unforeseen significant tide rises. It’s worth repeating (again, sorry): do not brave a rising tide. Storms and high winds can sometimes shorten the crossing window to Holy Island. This means that there may be surface water on the road during low tide (which is usually fine to cross, with care), and you might even find that the causeway becomes impassable earlier than the advertised time. Exercise vigilance and good judgement. Don’t take risks. The Holy Island causeway is an extraordinary place, and visitors often stop along the road, be it to take photos or track waders and other wildlife. The light and sky reflected in the sea is magnificent, as is the eerie view of the poles on the Pilgrim’s Way reflected in the water or nestled in the mists. However… in the last few months alone there have been several cases of drivers misjudging the soft shoulder beside the causeway road and getting stuck in the mud. Equally, some of the banks that seem like stable sand might be softer than they appear or have drops that are hidden by seaweed. Getting your vehicle stuck in mud is unpleasant at the best of times, but can be downright disconcerting if you’re in a race against time to get out before the road is reclaimed by the sea. If you do stop, it’s best to do so on the tarmaced or designated verges. Everything in this article refers to vehicles, not pedestrians. You can walk along the tarmac road (again, minding tide times), though it is not great fun, as it’s often very busy with vehicle traffic and at points there is not a lot of path to walk on. The real experience is walking on foot on the Pilgrim’s way, signposted by poles, and refuges. It is part of St Cuthbert’s way, a 62 mile long-distance walking route. The official (sound) advice is not to attempt this unless you are with someone who has local knowledge, but if you do decide to go it alone, note that the road crossing tide times are for vehicles, not for the Pilgrim’s way. You can find tips on how best to do this on the Northumberland Coast website. Most importantly, remember that if you mistime your crossing and start too late, the danger is not trivial. There have been deaths along this route. I don’t mean to be alarmist. Only to encourage you to research it well, and not to simply use the Council’s tide tables. Obviously, the logic above is reversed if you approach the causeway by water. For example, in August of 2017, a group of jet skies were left stranded in mud when the tide receded. Not a common occurrence, as you would expect. If you do get into trouble on the Causeway, dial 999 and ask for the coastguard. If you were meant to get on the island or off the island and the tide gets in the way, take a deep breath and find a place to have a drink and relax. 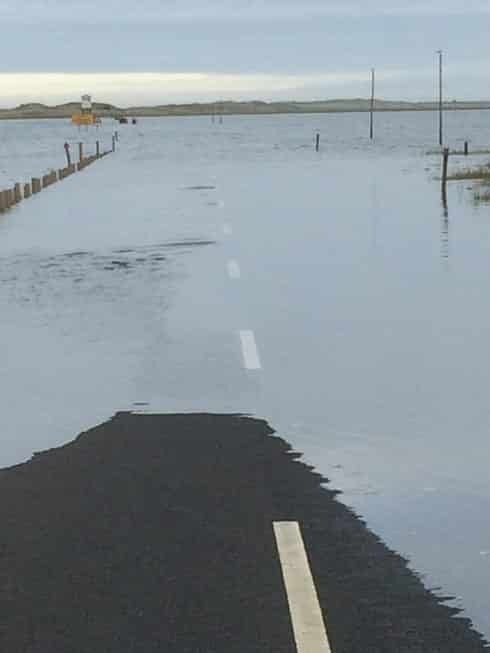 Holy Island Causeway during high tide: I took this one on a day in 2017 when I got delayed on the A1, and was too late to cross.